KUCHING – Are conversions and polygamy the new political ball game in Sarawak? It appears that a rising number of political aspirants and have-beens are rumoured to be converting from Christianity to Islam to better their chances of currying favours with Chief Minister Taib Mahmud. Whether this new gameplan will work for them in the coming state polls is left to be seen. But political observers are betting that a number of Barisan Nasional candidates “will fall” in the polls for this very reason. Meanwhile, the “hottest” gossip to hit Kuching streets is Engkilili state assemblyman Johnical Rayong’s (photo) recent conversion. Most of his constituents were in shocked disbelief at his conversion, that is until his angry first wife, Patricia Dexter Sudok, a Christian staff nurse in Kuching, spewed her angst. She reportedly learnt of her husband’s infidelity, marriage and conversion from an SMS message he sent her. According to the reports, Rayong was caught for “khalwat” and was forced to marry one Kamasiah Abdul Jalil, a divorcee in her 30’s with two children, who works in the Chief Minister’s Office. The story gets better. Patricia also said that Rayong had been harassing her to return and campaign alongside him as a “Christian couple” in order to mislead his Dayak voters. Rayong and apparently quite a few other shy “new converts” such as Mambong MP James Dawos Mamit and Marudi assemblyman Sylvester Enterie are seeking to conceal their new status from their Dayak constituents. Dawos, incidentally, is Deputy Tourism Minister and Enterie is an Assistant Minister in the Sarawak Cabinet. All this is more fodder for the opposition, it appears. In the case of Rayong, who seems to have a cupboard-full of “skeletons”, he may have lost it all even before the race. According to a SUPP leader, the party is uncomfortable with Rayong’s “history” and is re-assessing his candidacy. “The voters in Engkilili are not against him converting to Islam. Far from it. In fact, Christians and Muslims in Engkilili sit side by side in coffeeshops or restaurants. They also visit each other during Hari Raya and Christmas celebrations. They always live in harmony. “But they do not like him because he failed to inform them (of his new status) as well as his failure to look after his two Iban wives,” said the leader who declined to be named. Rayong, he claimed, has neglected his two families. His two wives were said to have complained to Deputy Chief Minister Alfred Jabu Numpang. They alleged Rayong had failed to come “home” for the past three months or so. His first wife, Patricia, is related to Jabu. So angry and disappointed are his wives that they are prepared to campaign against Rayong if he does defend his Engkilili seat. Besides his scorned wives, Rayong will also have to contend with issues over the authencity of his degree “as a medical doctor” and his political track record. His opponents have claimed that Rayong is only a doctor of homeopathy, but had presented himself as a medical doctor and opened up a clinic where he dispensed medicines and treated patients. They alleged that when the authorities demanded for his certificates, Rayong closed shop. It has also raised questions about his integrity. 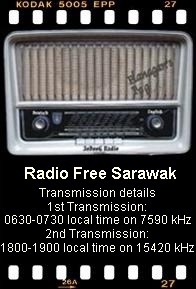 In the 2006 state election, Rayong won the Engkilili seat on a Sarawak National Party (SNAP) ticket. During his campaign, he attacked BN coalition partner SUPP and its candidate Johnathan Krai Pilo. But less than a month after his win, Rayong declared that he was independent and a BN-friendly representative. His angry supporters called him a “political frog” who is only protecting his self-interests. He subsequently applied to join an off-shoot of SNAP, Sarawak Progressive Democratic Party (SPDP) led by William Mawan Ikom. His application was initially accepted in 2007, but faced with strong opposition from SUPP and Taib’s Parti Pesaka Bumiputra Bersatu (PBB), he was forced to resign. There was also a time when he wanted to join Parti Rakyat Sarawak (PRS) if the Engkilili seat was to be given to PRS under a swapping arrangement with SUPP. But that arrangement failed to materialise and as a result, he lost interest in PRS. In the meantime, Rayong had applied to become a SUPP member and for two years he was left waiting. Then suddenly in September 2010, SUPP approved his application, much against the wishes of the majority of its members. The SUPP’s decision resulted in the resignation of the Engkilili branch chairman and the former five-term elected representative, Toh Heng San, from the party. But by joining SUPP, Rayong has left behind at least 60% of his supporters who were either members of SNAP or the defunct Parti Bansa Dayak Sarawak (PBDS) and supporters of the stillborn Malaysian Dayak Congress (MDC) of which he was the protem deputy president. In fact, his supporters are still angry with him for switching parties as they had voted him in on a SNAP ticket. Many SUPP members in Engkilili, too, may not vote for him as they consider him a “frog” that has upset their branch leaders including Toh and Krai. After more than 20 years as an elected representative, Toh has a strong following not only among the Chinese but also among the Ibans in Engkilili. Toh and Krai’s supporters will certainly not vote for Rayong for his criticisms against SUPP and for neglecting the welfare and interest of the Dayak community during the last election. Today, Rayong joins the party that he had severely condemned. In September, when accepting Rayong into SUPP fold, party president Dr George Chan described him as the most “suitable” candidate to represent the party as he was not only close to the people, but also popular with the rakyat. My fellow voters Engkilili/ Skrang, now you know who Johnical Rayong is. He is the biggest Frog I have ever seen in Skrang Scheme B. For everyone’s information this guy was originally from L/Antu but migrated to Skrang in the earliest 60’s because of Indonesian confrontation. He was formerly a medical assistant (MA). I did not know that he became a doctor as he was called by people. My friend was his former lecturer when he took homeopathy. From that you know that he is a liar. How come you said that you are a medical doctor while you don`t have a certificate bachelor in health science and medicine . People are not stupid Rayong. I know you very well. I am your former school mate. I know your late Brother Ramba Ngipa..
Don’t tell lies to people, sooner or later people will know. Nya aja kaban, dudi ari ila anang bula ke orang, nyangka enti orang bula ke nuan nyangka nuan enggai ga.